The primary purpose of this contract is to support UNICEF’s work at headquarters, in regional and country offices and with its partners on protection from sexual exploitation and abuse. The consultant will support the team working on this issue at headquarters. The Consultant will receive day to day guidance from Katherine Wepplo, Child Protection Specialist, PSEA under the and overall supervision of Tasha Gill, Senior Advisor, Child Protection in Emergencies. In 2015, widespread reports of sexual exploitation and abuse (SEA) by United Nations peacekeepers and non-United Nations forces against children surfaced in the Central African Republic (CAR), triggering scrutiny of the United Nations and its ability to protect vulnerable populations. A subsequent independent review on SEA by international peacekeeping forces in the Central African Republic (the ‘CAR Panel Report’) released in December 2015 found a United Nations-system failure to respond to SEA, including in the provision of victim assistance to children. UNICEF has been at the forefront of the United Nation’s response and has rapidly expanded its capacity in countries of concern to report allegations and provide assistance to victims. UNICEF is also actively engaged at a policy level from head-quarters in interagency effort to improve the United Nations’ response to SEA, a process that is being led by a United Nations Special Coordinator mandated by the Secretary-General to facilitate implementation of his Special Measures report. Child safeguarding, including protection from sexual exploitation and abuse (PSEA), is an issue at the core of our business. As a humanitarian agency dedicated to child rights, we consider all cases of sexual exploitation and abuse extremely seriously, and take all steps necessary to safeguard children within our operations. UNICEF has a zero tolerance policy towards SEA. Support the development of documentation to promote partnerships with donors, member states, civil society and UN agencies. 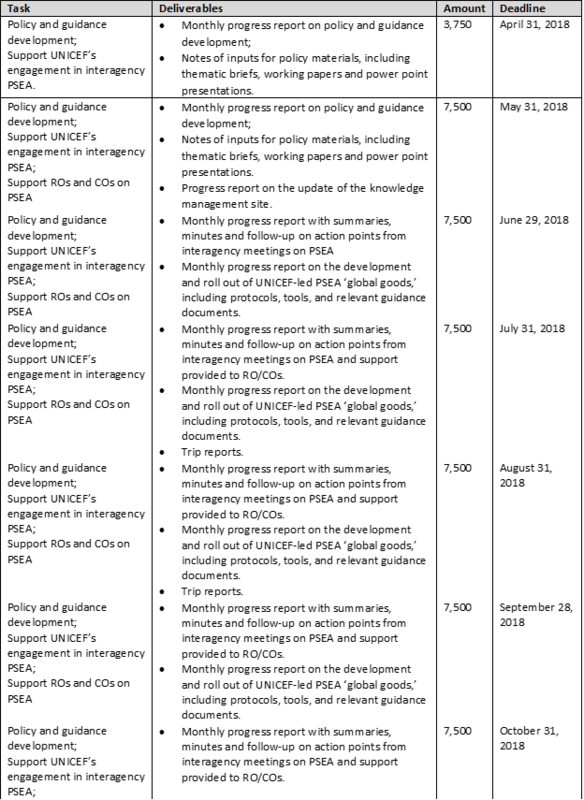 Support the development and implementation of key performance indicators on PSEA. Duty Station : The consultancy will be based at UNICEF headquarters in New York with limited travel. An advanced university degree (Master's) or equivalent in gender studies, social anthropology, law and women’s rights, sociology, public health, or other field related to PSEA. Excellent analytical, communication, writing and editorial skills in English. Proficiency in an additional official United Nations language (French, Arabic or Spanish) is mandatory. Excellent computer skills, including MS Word, Excel, etc. Strong understanding of browser-based applications, interfaces, workflows, and role-based access.